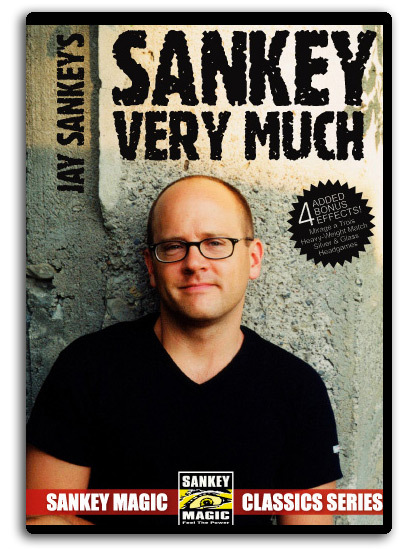 Today, when you order "Sankey Very Much by Jay Sankey", you'll instantly be emailed a Penguin Magic gift certificate. You can spend it on anything you like at Penguin, just like cash. Just complete your order as normal, and within seconds you'll get an email with your gift certificate. Sankey Very Much by Jay Sankey (DVD)Learn innovative sleights and an exciting collection of original close-up plots with cards, rubber bands, sugar packets, pool chalk and even band-aids! "Sankey Very Much" was taped in 1994 and features Jay at his off-the-wall, improvising best! Along with his side-splitting asides, Jay also demonstrates innovative sleights and an exciting collection of original close-up plots with cards, rubber bands, sugar packets, pool chalk and even band-aids! There's also some high-tech coin stuff that Jay had been keeping to himself for years! This very special re-release on DVD also features 4 BONUS EFFECTSthat were not on the original show! That means this DVD contains a whopping total of 25 routines! It's crazy!